THIS CAKE IS SOOOOOOOOOO YUMMY!!!!!!! You have got to make this ASAP. I used this strawberry cake recipe, then a chocolate and vanilla that I have made before. Feel free to use your favorite recipes or even box mixes if you are pressed for time. The original recipe fills each layer with strawberry jam, but as you know, I am a huge frosting lover, so I used frosting between the layers instead of jam. It is definitely more impressive looking without the layer of frosting, but sometimes you have to do what you like, not what might look better. This really does taste like Neapolitan Ice Cream and it is one of the best cakes I have ever had. It leaves a delicious aftertaste in your mouth and has you begging for more. Enjoy!! Cream together butter and sugar until light and fluffy; add Jell-O. Beat in eggs, one at a time. Combine flour and baking powder and add alternately with milk and vanilla; beating until just combined. Blend in strawberry puree. Pour batter into one (9-inch) greased and floured cake pan. Bake at 350 degrees for 25 minutes (mine took 33 minutes) or until done. Cool in pan 10 minutes, invert to rack and cool completely. Preheat oven to 350 degrees. Grease and flour one (9-inch) round cake pan. In a medium bowl, whisk together flour, baking powder and salt; set aside. In another bowl, whisk together sugar, eggs, vegetable oil, buttermilk and vanilla until smooth. Pour into dry ingredients and mix just until combined. Pour batter into prepared cake pan and bake for 22-26 minutes or until toothpick comes out clean. Cool in pan 10 minutes, then invert to rack and cool completely. Preheat oven to 350 degrees. Grease and flour one (9-inch) cake pan; set aside. In a large bowl, sift together cocoa, flour, sugar, baking soda, baking powder and salt. Add egg, warm water, buttermilk, vegetable oil and vanilla; mix until smooth, about 3 minutes. Pour batter into prepared cake pan. Bake until top springs back when lightly touched, about 24-25 minutes. Cool in pan 10 minutes, invert to rack and cool completely. a few drops red food coloring, opt. Cream together butter, shortening and cream cheese until fluffy. Add 2 cups powdered sugar. Add 1/4 cup strawberry puree, strawberry extract and food coloring and beat until smooth. Add remaining powdered sugar and strawberry puree alternately and beat until reaches desired consistency. 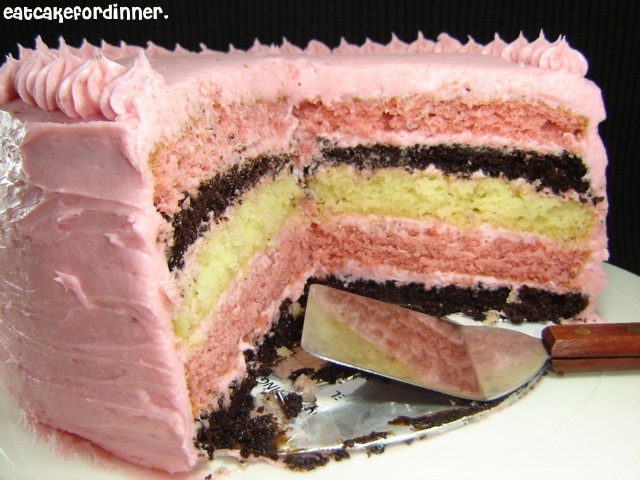 TO ASSEMBLE CAKE: Slice the strawberry and the chocolate cake layers in half horizontally. Trim the vanilla cake if you want it to be the same size as the strawberry and chocolate, if not, just leave it whole. Place one chocolate layer down on your cake board and top with either strawberry jam or strawberry frosting. Top with a strawberry layer and top with more jam or frosting. Top with vanilla cake, then more jam or frosting. Followed by the remaining chocolate layer, jam or frosting, then top with the remaining strawberry layer. 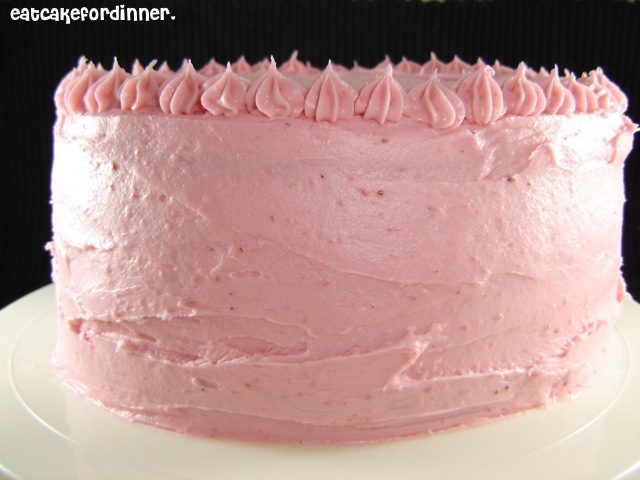 Frost entire cake with strawberry frosting and decorate as desired. Eat immediately or store in the refrigerator. Bring to room temperature before serving. I'm terribly afraid of making cakes, but I really want to learn how. Did you make and bake one layer at a time? Also, will the cake deflate if you bake it and take it out when it's "done" only to find it isn't? Thanks! Btw, your cake looks beautiful. I will make it one day. That looks super yummy, I don't even like cake that much. I may have to make this sometime. Esther, I baked the strawberry and vanilla layer at the same time, but the vanilla baked faster than the strawberry, so I had to get that out before it burned. I baked the chocolate layer separate. If my oven was big enough I would have baked them all at the same time, since they all bake at the same temperature. I have had cakes fall on me before from opening up the oven door too soon, but hopefully the recipes you use will be pretty accurate for timing. I always test mine with a toothpick and make sure no crumbs are attached. You can also lightly press the top of the cake and if it springs back then it is done. Thanks for the questions! Good Luck. My mouth is watering!! I will have to try out the recipes minus the eggs!! This looks awesome! I can't wait to try it! Oh my! Saw this on Whipperberry! I've got to try it! Thanks for sharing! What a beautiful cake! Thanks for linking up! love your layers in teh cake!! they look great! This looks so good. 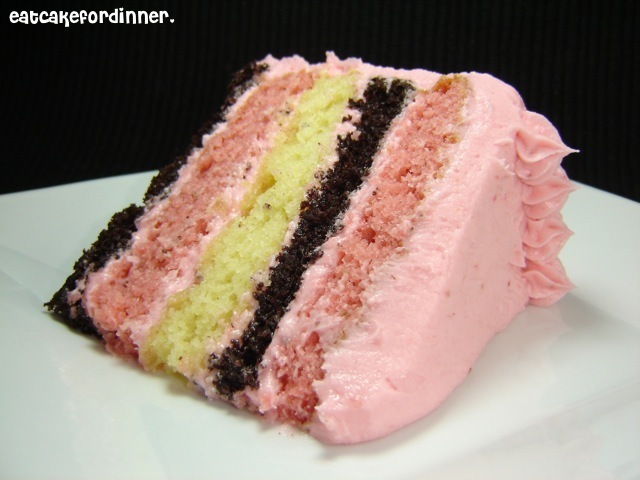 I don't even like neopolitan ice cream, but your cake looks like something I'd love to make. Yum! My daughter-in-law just made me one of these cakes for my 50th birthday. It was wonderful. Yours looks absolutely wonderful. This cake is perfection. I'd put strawberry cheesecake in the middle to make it more ME, lol. I think I'm in love!!! I feel compelled to bake this cake RIGHT NOW. :) Thanks for sharing! found my latest obsession! yumm! thanks so much for sharing, this looks amazing!!! glad to have found this site! I love it with the frosting. I'm glad you did it that way. And any site called 'Eat Cake for Dinner' is right up my alley:). WOW!!! You've got me hungry. Your cake is perfection. I've added it to my bake soon list. Thanks. Looks so good wow I must make this. This cake looks awesome, I love the colors! I'm hosting a link party and would love you to pop in and link up a recipe or two sometime! I'm also your newest follower! Your cake looks GORGEOUS and delicious! Beautiful job! What a beautiful cake! I love the layers - just like the ice cream! YUM! Oh my sweet yumminess!! Beautiful cake & it looks so good! This cake is SO BEAUTIFUL! I have made a neopolitan cake before where you basically drop scoops of each different batter into a bundt pan, then glaze with chocolate glaze. It was really good! I remember thinking it would be the perfect birthday cake, but YOUR CAKE is the super star! Gotta try that! Do you do anything special for frosting the cake - do a crumb coat or anything like that? That looks super yummy, I don't even like cake that much. I may have to make this soon, looks very much delicious, I hope it will be best cake for today 's dinner. Found you on Tip Junkie! This cake looks AMAZING! I've pinned it and tweeted it, thanks for sharing! I found your blog today and Im sure glad I did heeh You have such cute recipies!!! They all look soooo goooooood!!! This make up my day! Thanks for sharing such wonderful recipe! I really really want to make a layered cake and this post makes all my dilemma go away... Thanks! I have a couple of questions about the strawberry cream cheese frosting. 1) how many Tbsp = 2 cubes butter? 2) how many oz = 1 stick cream cheese? Great questions, I will update my recipe. P.S. I just made this again for my Mom on her birthday and my family loved it! Thank you, thank you, thank you for the rapid reply and for answering my questions. Gotta get baking now; can hardly wait to make this scrumptious creation! Also, looking forward to all your future entries.